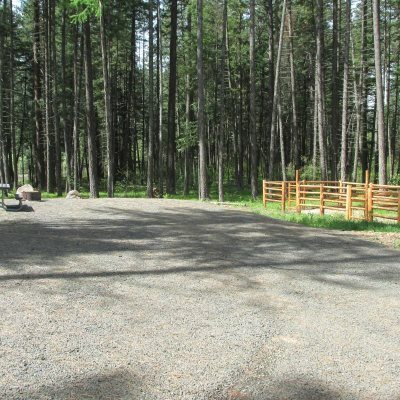 Heyburn State Park offers world-class equestrian opportunities. The list below outlines trail access within the Southwide Trail System, a multi-use trail system. All of the trails in the South Side system begin at the South Side trailhead (off Parkside Rd. ), with the exception of the Cedar Loop. There are four loops that are all connected Scout Out, Gandy Dancer, Rocky Top and Ponderosa. From the Cedar Loop you can access Rocky Top and the rest of the trail system. To travel the entire system takes 6 to 7 hours depending on you speed and energy. There are several places on the route to stop for lunch with tables and awesome views of Chatcolet and Benewah lakes. All distances are approximate. Scout Out Loop begins at the South Side Trailhead parking lot and follows a level bench of Douglas-fir and Pondarosa pine before switch backing down into the Pee Dee Creek canyon. There it follows Pee Dee Creek downstream for about a quarter of a mile before climbing back to the bench and meandering back to the trailhead. As you climb out of the canyon you have good views of Chatcolet Lake and the Trail of the Coeur D Alenes bridge. The Scout Out Loop takes approximately an hour to complete. Follow the Scout Out Loop to Pee Dee Creek where you will cross the creek and the Pee Dee Creek road. You will then wind your way over the ridge through open Douglas fir timber to the Bill Morris road. There you can turn down the road for about two hundred yards where you will tie back into the trail crossing the road. You will cross a small stream and continue down the heavy timbered draw on an old road towards Highway 5. This is a moist North slope covered with Western Red Cedar, Douglas Fir, Grand Fir and a great place to find Trillium in the spring. Just above the highway you will travel under a railroad trestle that towers nearly 200 feet above the creek. There the trail turns and follows just above Highway 5 back to Pee Dee creek. Follow the Pee Dee Creek Rd back up the hill under yet another trestle to where the trail leaves the road and crosses Pee Dee Creek and continues back up the creek to the Scout Out Loop and back to the trailhead. Begin at the trailhead and follow Scout Out and Gandy Dancer to the Bill Morris road. Rocky Top begins at the Bill Morris road and then circles a large bench between the Bill Morris road and Cottonwood creek. 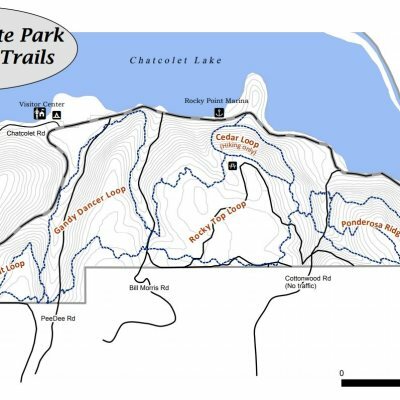 Most of this trail is through open stands of large Ponderosa pines with awesome views of Chatcolet and Benewah lakes. During the spring and summer the open areas are a blanket of color. Wild flowers of all colors, Heartleaf Arnica, Arrowleaf Balsamroot, Coulter’s Lupine and many more spread their splendor under the spring time sun. Close your eyes and drink in the smells of early summer as you meander through the stately pines. The Ponderosa Ridge loops also begin at the trail head. Follow the trails to about midway on the Rocky Top Loop where the Ponderosa loop will drop down and cross Cottonwood Creek and climbs back up the other side. This loop will take you through everything from damp North slopes blanketed with Cedar and Grand fir to open Ponderosa ridges. It winds through several drainages before topping out on the ridge above Benewah Lake. Be sure to take your camera as there are many beautiful vistas from above the lakes. There are picnic tables at this view point. You may see deer, elk and the occasional bear. This loop will then drop down a series of switchbacks and cross Cottonwood creek again before climbing back to the Rocky Top Loop. Cedar Loop, unlike the others, begins at Rocky Point. The trail leaves Highway 5 at a point right across the highway from the wide spot at the upper Rocky Point Loop road. You can see the trail marker sigh just above the highway. The Cedar Loop climbs the hill above the Rocky Point Marina to a point where it ties in with the Rocky Top Loop trail. 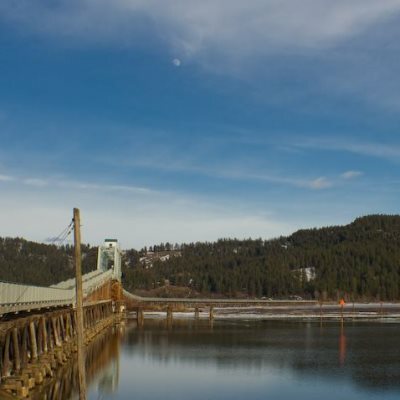 There is a picnic table at this junction and a great view of Chatcolet Lake and the Trail of the Coeur D Alenes bridge. The trail then follows the Rocky Top Loop East for about a quarter of a mile before dropping back down to the starting point. This trail is hiking only.